Obama thanks youth for helping inspire, energize "improbable journey"
(CNN) -- President Barack Obama and first lady Michelle Obama were dancing their way through 10 official inaugural balls after a day of pomp and circumstance that saw his first presidential address and excitement about her inaugural dress. Michelle Obama, dressed in Jason Wu, and President Obama at the Home State Ball Tuesday night. The Obamas were serenaded by Beyoncé during their first dance at the Neighborhood Ball Tuesday night. Beyoncé sang Etta James' "At Last," from her role in the movie "Cadillac Records" as the couple laughed and took their first spin around the dance floor. Before the dance, Obama addressed the crowd, which erupted in applause when he entered the room. All eyes certainly were on Michelle Obama, who had kept her choice of a designer and dress style a secret until the moment she entered the dance floor. The first lady was clad in a long white gown designed by up-and-coming designer Jason Wu, 26. The gown made especially for the first lady is made of ivory silk chiffon, embellished with organza and Swarovski crystal rhinestones and silver thread embroidery, according to one of Wu's publicists. Wu told CNN he didn't know that she had chosen his gown until her first ball appearance Tuesday night. "It's thrilling. ... For a young designer, I couldn't ask for any more than this," said Wu, whose design style combines modern lifestyle dressing and haute couture, according to his Web site. He designed and delivered the dress at the request of Michelle Obama's aides in December, according to fashion expert Mary Alice Stephenson, contributing editor at Harper's Bazaar. "It's about hope. It's about newness," he said. "It's all a little dreamlike, and we're making history, and I wanted to really reflect that." The Neighborhood Ball, a first of its kind and one of the balls open to the public, was the first of 10 official balls that the Obamas were scheduled to attend. For the new president, the first was particularly important. "I cut my teeth doing neighborhood work and this campaign was organized neighborhood by neighborhood," he said. For that reason "this ball is the one that captures best the spirit of this campaign," Obama said. The Obamas then moved to their second ball -- the Home State Ball, for Illinois and Hawaii -- at the Convention Center. After greeting the crowd by saying "Aloha," the president thanked many in the crowd who he said were old friends who had been part of the couple's lives for awhile. "This is a special ball because it represents our roots," he said. Next, the Obamas made their way to the Commander-in-Chief Ball, attended by many members of the military, including wounded veterans. "It is wonderful to be surrounded by some of the very best and bravest Americans," Obama said. "Your courage, your grace and your patriotism inspire us all." Obama then introduced members of the military from Illinois stationed in Kabul, Afghanistan. After thanking them, Obama took time for lighter banter, polling the members of the military about whether they were Chicago Cubs or Chicago White Sox baseball fans. "Terrible!" quipped Obama, known to be a huge White Sox fan, as most said they were Cubs fans. Then Obama introduced his wife, who took a moment to emerge from backstage. "I may have been stood up," he joked, before she came out for their next dance. 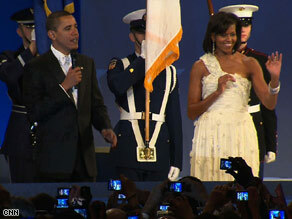 Next, the Obamas turned their attention to the Youth Inaugural Ball, where people between the ages of 18 and 35 gathered. "When you look at the history of this campaign, what started out as an improbable journey -- when nobody gave us a chance -- was carried forward, was inspired by, was driven by, was energized by, young people all across America," Obama said. The president thanked the young people who came out to vote in dramatically high numbers, especially compared to past elections. He said a new generation inspired an older generation, and "that's how change happens in America." Afterward, the Obamas moved to the Home State Ball for Delaware and Pennsylvania, honoring Vice President Joe Biden. "We are grateful to you, not only for the trust you bestowed, but also for a guy named Joe Biden," Obama said. Biden was born in Pennsylvania and later moved to Delaware, which he represented in the U.S. Senate. The Obamas then visited the rest of the parties earlier than scheduled and in quick succession, spending about five minutes each at the Mid-Atlantic, Western, Midwest, Southern and Eastern regional balls. At the Western Ball, singer Marc Anthony helped entertain about 11,500 guests, including film director Ron Howard and "Curb Your Enthusiasm" actress Cheryl Hines. When the Obamas arrived, someone shouted "I love you" to the president. "I love you back," Obama responded. "Michelle loves you, too." Before the couple's dance at the Midwest Ball, the president introduced the first lady by saying he'd "like to dance with the one who brung me, and who does everything I do except ... in high heels." The first couple's last dance of the night -- at the Eastern Ball -- happened shortly after 12:35 a.m. Wednesday. There was more than chips and dip for the new president and his fellow partygoers. "We will have a little more than light fare," said Roussell, who listed such menu items as penne Italiano and chilled chicken roulades with tomatoes, artichokes and pine nuts. Those not lucky enough to score a ticket or an invitation could watch on television. "We are trying to make this the most accessible inauguration in history," Roussell said. "We are encouraging people to plan parties in their own neighborhoods, and they can tune in and celebrate along with the president." CNN's Lisa Respers France, Mallory Simon and Rebecca Sinderbrand contributed to this report.